Single Conductor Pre-Wire cable in a Black?or White?outer PVC jacket. 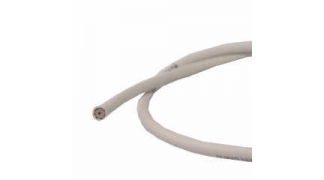 ?Planet Waves’ bulk coaxial cable is precision manufactured in the USA to 75 ohm HD standards. All cable features our In=Out? Technology for pure signal transparency. This cable is full bandwidth, broadcast quality with high impedance and low capacitance, enabling you to use it for all audio/video applications. The same cable can be used for everything from Component to Composite Video, Analog to Digital Audio, Subwoofers, S/PDIF, even RF applications like HD Satellite and CATV. Planet Waves Pre-Wire PVC jacket is slick and rigid in order to make pulling faster and easier with far less snags. All Planet Waves Pre-Wire cable meets the following specs: Made in USA / Meets 75 ohm HD standard / Sweep-tested 3GHz over 100ft with nominal db loss / Nominal Capacitance 18.2 pF/ft / Standard bare copper / 100% shielding with 80% aluminum braid & tin foil shield / Nitrogen-gas-injected foam PE dielectric / PVC Jacket / CM & CL2 rated for in-wall installations / Max Pulling Tension 2359 PSI / Max Bend Radius 2.25 inches Planet Waves coaxial cable is part of proprietary custom cable system. All Planet Waves cable must be used with Planet Waves connectors in order to ensure proper termination. Planet Waves guarantees all product and parts under limited warranty.